We have found that often, companies are inundated by technical terms - AI, VR, Machine Learning, they understand that they’re important, but they don’t know how to apply it to their business, how to operationalise the technology to make a difference to their bottom line, so we’ve taken a closer look into how AI is being used, in practical terms, in the Travel industry. AI allows brands to analyse thousands of online behavioural patterns and interactions and come up with predictions to make each customer’s online experience just that little bit more personal. It is benefitting travel companies by improving customer loyalty and optimising every online action to bring down costs. Customers experience a better service, companies profit, it’s a win-win situation. There are two main fields where AI is really changing the industry: machine learning and virtual assistance. Machine learning can be understood as the automated sales assistant the travel industry was in desperate need of. It can help with anything from helping customers with bookings and check-ins to automating processes and improving customer service jobs. It has helped to speed up processing times and left less room for mistakes. To give you a practical example, machine learning is how you receive automatic hotel recommendations in a city where you have just booked a flight to, filtered according to your preferences. Making your search process a whole lot easier. 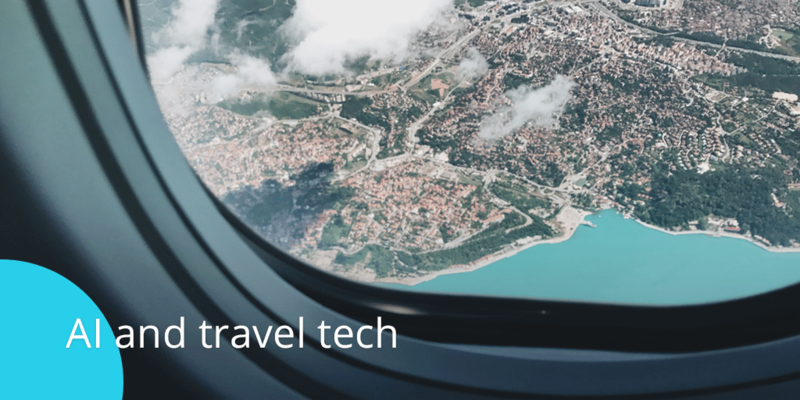 Machine learning can also open doors to new revenue streams for travel companies. The ability to track how people behave on your website, enables you to tailor their browsing session to fit their needs. Do they need live assistance? Will a promo code tip them over? Do customers typically drop off on a certain page? By improving their Customer Experience, you’re in a much better position to increase your online conversion. Virtual assistance has also hugely improved as a result of technological advances, as a market we have understood that bots are best used in combination with human assistance. The bots answer the frequent, easy questions, and leave the more complex bits for your agents. Maintaining the right balance between automation and human contact is extremely important. What’s more, virtual assistants are a valuable opportunity for companies when done right, imagine being able to go “Alexa, find me the cheapest flight to Hawaii in September” and have a list of suggestions at the tip of your fingers. Virtual assistants could also have the ability to optimise journeys based on your preferences. The opportunities are endless. The way in which companies embrace these innovations will determine if they stay ahead in the market. We’ve given some examples, but be creative, there are millions of ways in which you can use customer knowledge to deliver better, more personal online experiences that will make you stand out in a crazy overcrowded market. Tech is just jargon until you start applying it to your business, so what are you waiting for? Interested in reading more about customer experience? Check out our whitepaper below!